One of the strong beliefs I hold is that technology automation is going to have a major impact on our world. It is going to mean a lot of people need to re-skill if they want to stay relevant (including IT Pros). I have been a big IFTTT user for many years so this is great news. Let me give you some insight of what you can do. After you create an announce on IFTTT you need to connect up your channels. They may include services like WordPress, Facebook, Twitter and now Office 365. You simply locate the channel you wish to connect and select it. You then select the option to Connect. 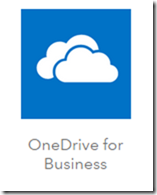 You’ll then need to login to your Office 365 account to authorise IFTTT to access it. 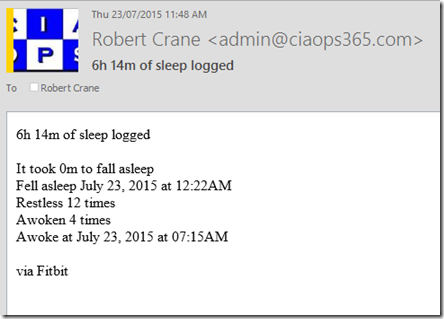 So what I have done above is create an automation recipe that takes daily sleep information from my FitBit and uses Office 365 email to send an email to my normal email account (i.e. from my ciaops365.com domain to ciaops.com domain). When triggered, you see that I receive an email with my previous nights sleep details in my normal inbox (showing a poor nights sleep in reality). Impressive eh? And simple to set up. The people and businesses who will be most effective in the future will be the ones that take maximum advantage of technology automation. 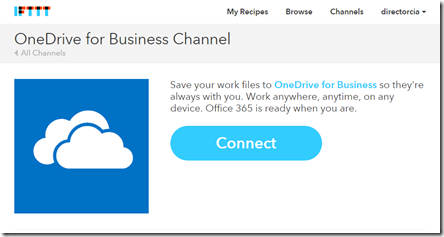 IFTTT is just a simple example of what is now possible with Office 365. I’d suggest now is the time to get automated!